Finding verified tickets guaranteed to get you into live events just keeps getting easier. That’s a big part of Ticketmaster’s mission, and it’s why we’re unveiling our new integration with Google Assistant. We’re using new functionality to bring the Ticketmaster shopping experience to a new platform on mobile devices and will expand to other devices powered by Google Assistant in the coming months. 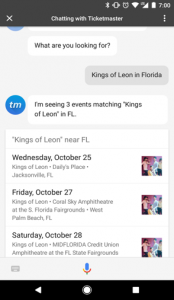 When shopping with Ticketmaster on Google Assistant, you can search for events using event dates, location, genres or specific artists – all by voice. All you have to do is talk or type what you’re looking for. 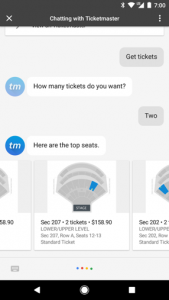 Even if you aren’t quite sure what you want to check out, Ticketmaster on Google Assistant will help. You can be as specific or as vague as you want. 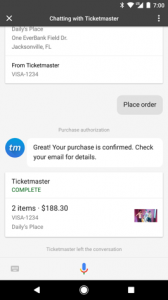 To get started using Assistant, just say or type, “Ok Google, talk to Ticketmaster”. You can then say something like, “What concerts are playing in Brooklyn tonight?” and this will turn up a list of artists playing in the area. And if you only want to check out indie bands, you can say, “What indie bands are playing in Brooklyn tonight?”. If you know exactly what you’re looking for, you can also say, “Find me Chance the Rapper tickets in November in Chicago” and it will show all of the available dates. From there, the buying experience has never been easier. You can select your seats, along with how many tickets you want, and check out is a breeze. With tickets in your cart, confirm your order and pay with a credit card on file in your Ticketmaster account. Once your purchase is complete, you’re all set and we’ll send you an order confirmation email. Ticketmaster wants to help fans go to their favorite events – whether it’s music, sports, theater, or comedy. And we continue to innovate to make it as easy as possible for fans to get tickets to the events they love. That’s where Ticketmaster with Google Assistant comes in. It’s a new, engaging way to buy tickets. And we hope you’ll love it. No matter what type of live events you love, Ticketmaster has you covered – and now you can buy tickets with the ease of asking Alexa. 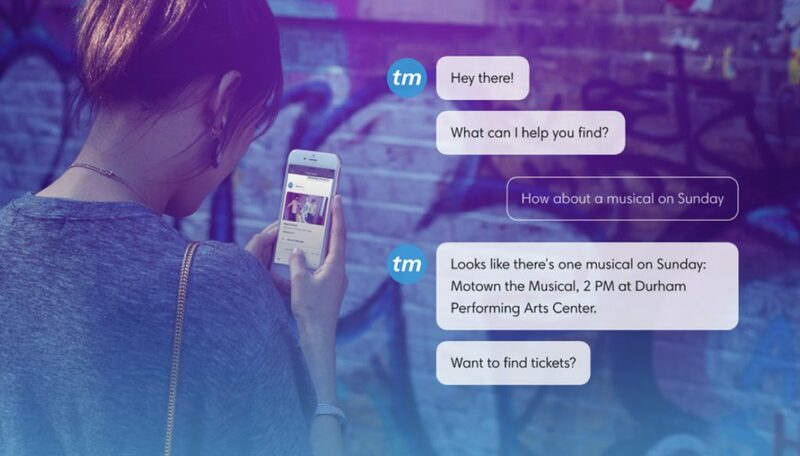 Ticketmaster Assistant for Facebook Messenger is here!